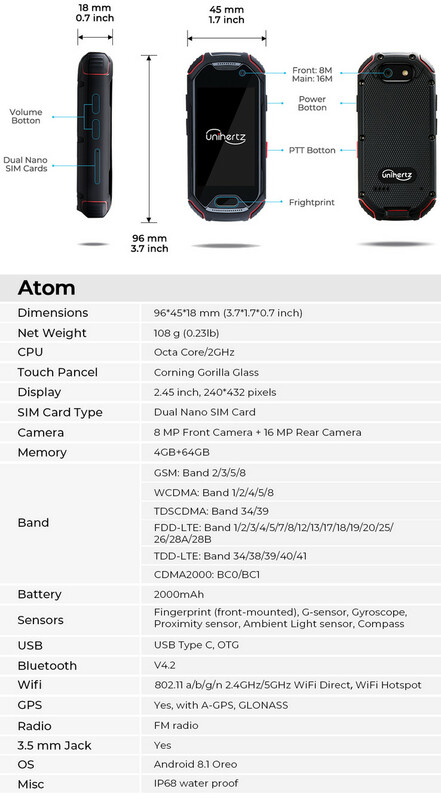 The 2.45-inch Android smartphone will carry all the mainstream features of a modern smartphone including NFC, Gorilla Glass, USB Type-C, FM radio, IP68 certification, 4G LTE, Android 8.1 Oreo, Bluetooth 4.2, and even a fingerprint sensor for just $160 USD. The design suggests it to be a spiritual successor to the Unihertz Jelly series. Chinese manufacturer Unihertz is notable for its Jelly series of Android smartphones. 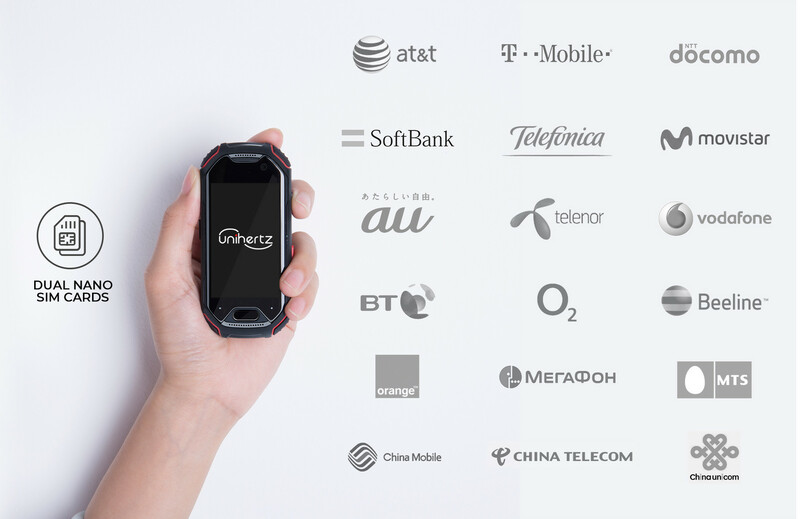 The Jelly and Jelly Pro are some of the smallest 4G smartphones currently available in the market measuring just 92.3 x 43.0 x 13.3 mm each. The 2.45-inch display and miniature form factor make the Jelly a perfect workout companion or backup smartphone when traveling. 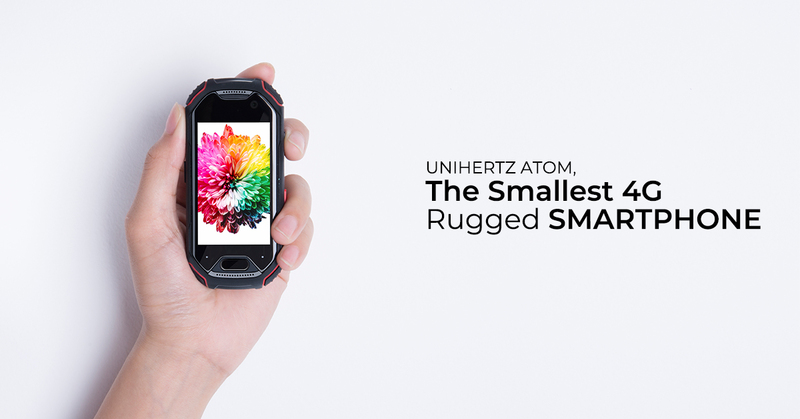 The tradition continues with the 2.45-inch Unihertz Atom which promises to be the world's smallest rugged 4G smartphone. It will be slightly larger (96.0 x 45.0 x 18.0 mm) and heavier (108 g vs. 60.5 g) than the Jelly but with USB Type-C, upgraded cameras, Gorilla Glass, NFC, and an integrated fingerprint sensor. The battery will receive a large upgrade as well from 950 mAh on the Jelly to 2000 mAh on the Atom. We're wary of the performance of the Atom as the Jelly suffered from abysmally slow navigation from its MediaTek quad-core 1.1 GHz SoC. Unihertz has not disclosed the exact name of the octa-core 2.0 GHz SoC in the Atom, but our guess is that it will be yet another MediaTek offering. Check out the successful Kickstarter here for more information on the Unihertz Atom. The smartphone is expected to launch in October for about $160 USD.